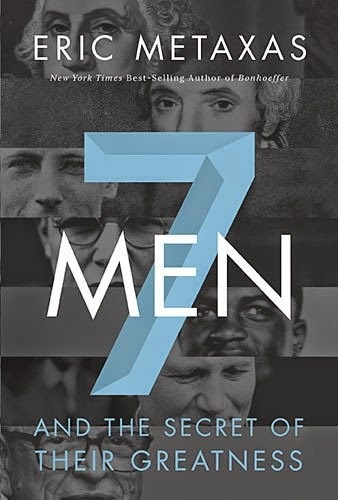 Behold & Reflect: Review of Metaxas' "7 Men"
Review of Metaxas' "7 Men"
I was excited to get a paperback copy of Eric Metaxas' celebration of Christian role models 7 Men and the Secret of Their Greatness for two reasons. Regular readers of my blog know I'm a bit of a feminist, but I'm also mom to three boys and I want them to aspire to the best kind of life. Second, I enjoyed reading Metaxas' 600-page biography of German theologian and martyr Dietrich Bonhoeffer two summers ago. While I highly recommend getting to know this hero of the faith and the aforementioned tome, 7 Men is far easier read, which provides a primer on Bonhoeffer as well as inspiring chapters on George Washington, British abolitionist William Wilberforce, Olympic runner Eric Liddell, baseball player Jackie Robinson, Pope John Paul II and Prison Fellowship founder Chuck Colson. In seven miniature biographies, Metaxas showcases each man's personal faith in Jesus the centerpiece and secret to their enduring influence. For me, the first half of Washington's chapter was the hardest to read. Our nation's father struck me as an entitled social climber with a shocking lack of compassion in some early battles. But eventually, I was impressed that Metaxas could transform the "grumpy grandfather" he appears to be on the dollar bill to a valiant hero who not only fought for our country's independence, but also the subtler battle against pride in order to birth a democracy. My favorite chapters, Eric Liddell's and Jackie Robinson's stories, moved me to tears. The protagonist of the 1980s blockbuster Chariots of Fire, Metaxas aptly argues, lived a life far more amazing after his Olympic victory as a missionary in China. As the first black baseball player to enter the major league, Robinson's ability to take the brunt of racist backlash scorn and abuse, all without retaliation, struck me as truly supernatural. Readers should know that each story is clearly filtered through the Metaxas' lens as both a Christian and unabashed fan of each of these men. Some might find that the author's insertion of himself into each chapter detracts from the stories, but I felt that each story was really inspiring enough to make up for this slight drawback. I recommend this book to anyone looking for historic Christian role models. And I eagerly await the release of 7 Women, which is excerpted (a bio of Corrie ten Boom) at the back of this book. Review of "Jesus Outside the Lines"
Review of "The Postage Stamp Vegetable Garden"